Summary: A former neo-nazi skinhead tries to prevent his younger brother from going down the same wrong path that he did. 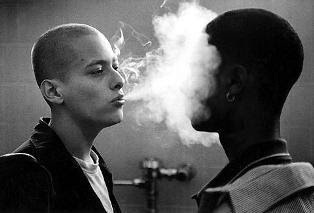 It’s the first scene of American History X that sets the tone of the movie ahead. Derek murders the three black guys who have been trying to break into his truck. But what makes this incident more impactful is his young, innocent brother Danny watching the whole thing from the sidelines. Derek Vinyard (Edward Norton) was only a teenager when his father was murdered by black drug dealers. The death of his father draws Derek towards a neo-nazi movement heralded by Cameron which targets and agitates against non-white community. The influence of his inclination towards this movement and its ideologies is seen at most in Danny (Edward Youlang) who begins to somewhere idolize them. One can judge that the story though shown to be as Derek’s transformation if understood deeply is the turmoil faced by a young boy who wishes to do everything his elder brother does. Danny whose life begins to resonate much of Derek’s, writes a history paper in school which praises Hitler. It’s this that triggers the principal to throw him out of the school. But on insistence of Dr. Bob Sweeny, English teacher he is let off with a lighter punishment. 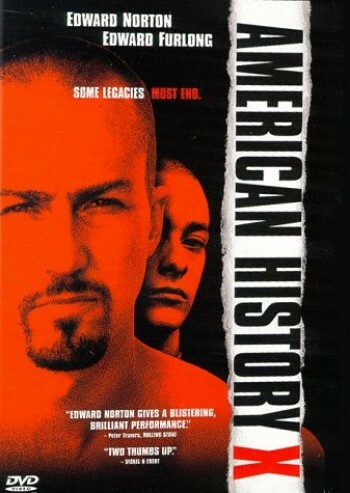 And the punishment is that he has to attend a class with Sweeny called “American history X”. As part of his first assignment Danny is asked to write a paper on Derek and events leading up to his imprisonment. The movie is of course narrated in nonlinear fashion. And so far we know that Derek has been imprisoned for his cold blooded murder and all his life up to that point, he has pursued a trajectory of hatred and racism. In fact even his conviction in the crime does not make him feel guilty for his actions. But it’s when Derek is released from jail for good behavior and he returns home that the story takes an opposite turn. Derek finds out that his family has been a wreck after him. Financially depleted with four kids to take care of his mother has begun to suffer from cancer. But its Danny which alarms him the most. He has taken to Derek in all respects and has joined Cameron’s group equipped with all the neo-nazi tattoos and the clean shaven look. Sweeney briefs Derek about his Mein Kampf essay and also the imperative expulsion from school. The night when Cameron throws a party to welcome Derek’s return, Derek confronts him about all his actions. He says that he had come to the party only to leave Cameron’s group and that he wants his brother to stay away from all this. But Cameron doesn’t get moved by it and the chain of events finally lead to Derek and Danny running away from the party to escape more attack. It’s here that Danny shouts at Derek and expresses his confusion over his metamorphosed behavior. Derek has returned a changed man. He has stopped believing in his principles of yore. He has come to terms with the fact that hate only breeds hate. And all this has been the result of his time in prison. He narrates to Danny how when he went to jail he befriended a group of prisoners called Aryan Brotherhood. Of course this group like Cameron’s is an all-white group and is involved in hate crimes. But it’s when he realizes that they are into drugs too that Derek objects. This creates a lot of bad blood and what happens is beyond anyone’s imagination. Derek is raped by these people in jail. And he realizes that his trust has been floundered. He concludes that they are of no one’s- whites or blacks, they are there for their own motives. In jail Derek is helped by a black man who becomes friends with him and it’s because of his support that Derek is left alone by other black groups and is able to survive his term without being further attacked. This incident marks his transformation and he now wants to start afresh and wants Danny to follow his path. 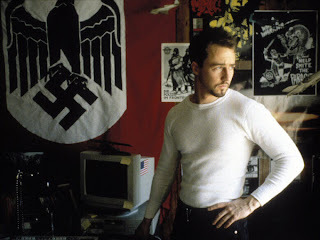 Derek and Danny return home and clear out all the neo-nazi posters and things from their room. They decide to start a new life. 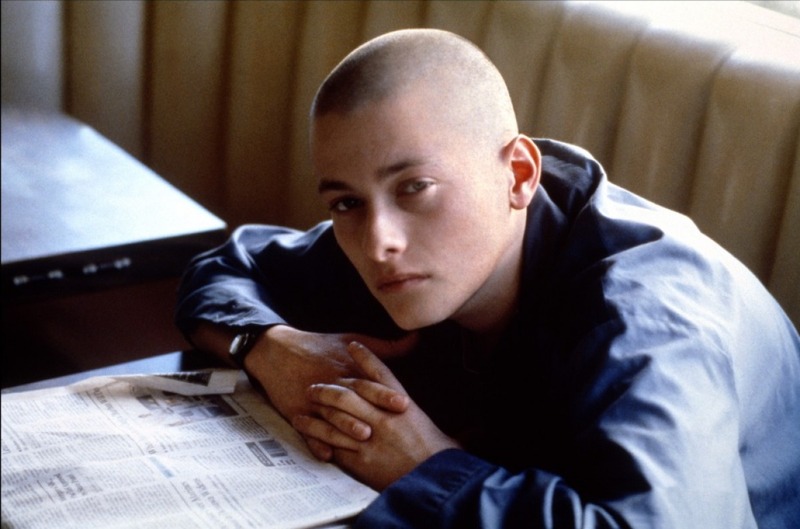 Next morning Danny decides to submit his paper for “American History X” and Derek decides to meet his parole officer. Whether they are able to get out of this or not? Whether their reform came a bit too late? All these questions can be answered if you do watch this movie. 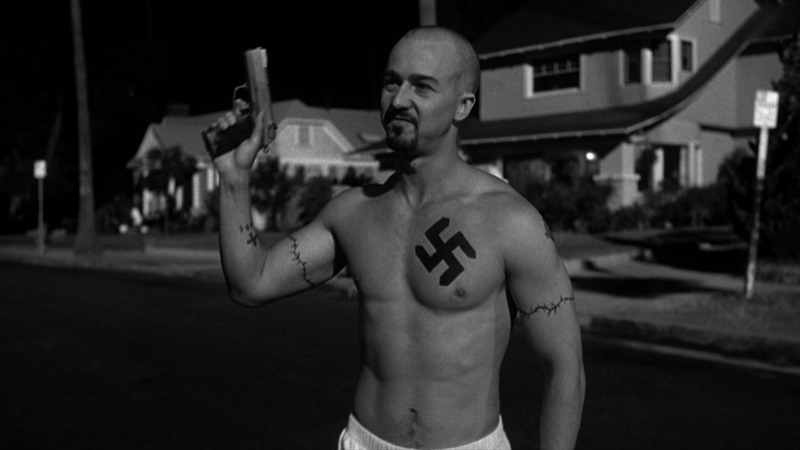 Ranked at 33 in IMDB ratings, American history X is one of the best movies which play the devil’s advocate in this racist war. There is a scene where Derek stands outside a store run by Koreans and with immigrants as workers and incites the white guys to vandalize it, is one of my favorites. Norton, at its best in this movie, plays the two sides of the same coin flawlessly. The movie is perfectly paced and the incidents are scattered in a way that always leaves you wanting to know next. Edward Norton already a seasoned actor will definitely impress you but its little Youlang with his dead pan expression that presents the surprise package. The movie is more or less about these two and what transpires between them. If you are a huge fan of Edward Norton (like enjoyed him in Hulk or The Illusionist) then this movie is a must watch for you. His style like always is never the same in any two movies and in this too, the innocent, lopsided grin that he always sports will leave you enchanted even as he spews venom and hatred minute after minute. This review comes at a time when there is an incident in India where someone has undergone a similar journey. The resemblance in the two stories (reel and real) is uncanny. For more on the incident, please click here. This guest review is written by Richa Singh. Richa is Writer, Photographer, Wife, Automobile Design Engineer, Blogger, Trained Classical Singer, Kathak Dancer, Sister, Daughter, Human - all stumbled into in reverse order. Richa blogs at The Philosopher's Stone. The views expressed by the author are personal. Next Post: Do Movies Inspire Tourism? A very good review of a brilliant, if very depressing, film with a great performance from Norton. The best line of this review which summarizes Edward's performance "Norton, at its best in this movie, plays the TWO SIDES OF THE SAME COIN flawlessly"
I think Norton's performance is the movie's strongest point. In fact, it's Norton's performance that raises the movie above mediocrity. And it's simply amazing how he's able to play the two sides so flawlessly... something that reminds me of his supernal portrayal in David Fincher's Fight Club.